She would continue to issue creative and smooth pop singles until the early 1980s, many of which would reach the lower reaches of the BILLBOARD MAGAZINE Pop Singles Chart. 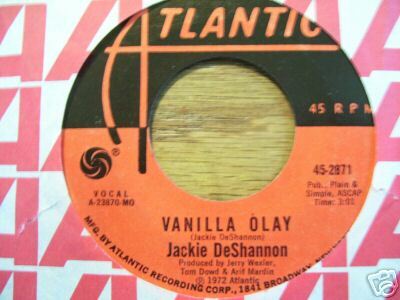 “Vanilla O’Lay” was representative of her music at the time. Released during the late spring of 1972, it was a creative pop song than deserved better that its peak at number 76. Jackie DeShannon scored two top ten hits during the 1960s, “What The World Needs Now is Love” (#7) and “Put A Little Love In Your Heart” (#4). She would continue to releases singles for the next several decades but only one would reach the top 40. 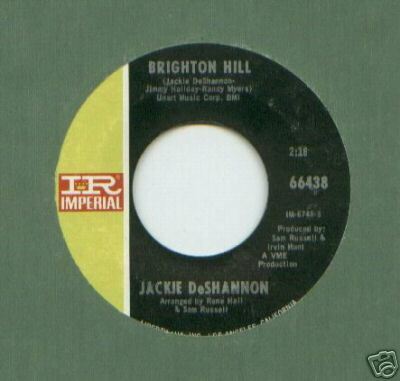 “Brighton Hill” was the type of smooth pop she would continue to issue the rest of her career. It first reached the BILLBOARD MAGAZINE Pop Singles Chart, March 7, 1970, but would stall at number 82. DeShannon would go on to gain fame as a songwriter. While she never had a number one song herself, her Bette Davis Eyes, as recorded by Kim Carnes, became one of the biggest single hits of all time by remaining on top of the charts for nine weeks. That probably equaled a whole lot of royalty checks. Jackie DeShannon is one of the better, if under-appreciated, singer/songwriters in all of American music. Her career now extends back 50 years and has produced dozens of hit songs and albums. She was an opening act on The Beatles first North American tour and was recently inducted into The Songwriters Hall Of Fame. Her songbook has been waiting for interpretation, and what better person to re-record these songs than DeShannon herself? When You Walk In The Room (scheduled for release on September 27) finds her revisiting 11 of her best-known songs. DeShannon has one of those unique voices that is instantly recognizable. And here she wisely strips the music to its basics as an acoustic guitar and bass provide the major instrumental backing. Throw in some judiciously placed strings and electric guitar and you have the definitive re-interpretation of her work. She takes this material in a gentle direction and while the songs can be considered straight pop, many times her approach moves over into folk territory. Her voice sounds better than in the past as she is able to adapt the material to suit her current capabilities. “When You Walk In The Room” is the lead track and sets the table for what will follow. She recorded the song with a different tempo that renders it into something much simpler focuses on the lyrics. The acoustic guitar playing is mixed just right as each note is crystal clear. DeShannon recorded “Bette Davis Eyes” in 1974 and released it on the album, New Arrangement,but the song will always be most associated with Kim Carnes, whose 1981 version topped the Billboard Pop Singles Chart for nine weeks and was the second-ranked single of the decade. DeShannon, as the co-writer of the track, won the 1982 Grammy for Song of The Year. Here she strips the song down with only an acoustic guitar and some subtle bass lines in support. Her relaxed, smooth vocal is the exact opposite of the one Carnes delivered with such intensity. While she wrote or co-wrote nine of these 11 tracks, one DeShannon did not pen was “Needles and Pins,” which originally was an obscure single for her in 1963. The Searchers scored a pop hit with an uptempo version of this Jack Nitzsche/Sonny Bono composition about a year later. Here, DeShannon renders it as a creative ballad. Her two biggest hits, “What The World Needs Now Is Love” and “Put A Little Love In Your Heart,” are present but the big surprise of the album is “Bad Water.” She gets a little bluesy with the vocal, which recalls her approach in the past. Overall When You Walk In The Room is a wonderful journey through Jackie DeShannon’s past with a modern twist. By presenting many of her best songs at their simplest, she proves they were indeed worth revisiting. Article first published as Music Review: Jackie DeShannon – When You Walk In The Room on Blogcritics. Everybody’s career has to begin somewhere. 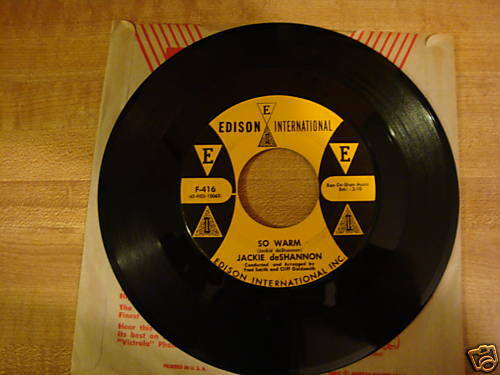 She released “I Wanna Go Home” on the old Edison International Label during 1960. Today it is a very difficult single to locate and is highly collectable. It wasn’t a hit, but it was a start. During the 1960s, I never could decide who was better looking, Marianne Faithful or Jackie DeShannon? Marianne Faithful was best known for her relationship with Mick Jagger, which almost cost her life because of heavy drug use. By the end of the decade her singing career had virtually ended and it would be ten years before her BROKEN ENGLISH album would begin her comback. Her voice was far from the clear soprano of the 1960s as hard living had given it a rough, harsh edge. 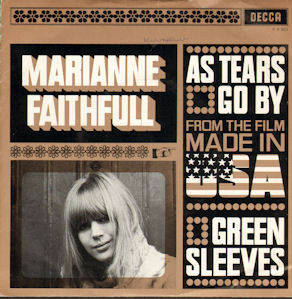 She released her cover of The Rolling Stones song, “As Tears Go By,” November 28, 1964. It would become one of her four top forty singles in The United States and her highest charting at number 22. Her angelic looks and voice belied her image and actual lifestyle. She was one of the more interesting puzzles of the 1960s. I turned the big six zero on December 30th and I have no idea how that happened. I am a quintessential baby boomer, a part of the Woodstock generation, flower power, and The Vietnam War. I saw Hendrix and the original Who live and bought Sgt. Peppers and the Pet Sounds album off the shelf at my local record store. My children and now my grandchildren find my record collecting obsession to be both odd and a little amusing but no one wants the collection after I’m gone. I find it a little depressing that musicians who have been a part of my life for decades are now passing away not from addictions or accidents but from natural causes. I bought and paid for my first record album in 1964. I have been trying to think of which albums have spent the most time on my turntable or in my disc machine but that has proven to be an impossible task, so I have settled for the twelve that have received regular play during the past several years and are currently essential for me at sixty. 1) All Summer Long by The Beach Boys. This may actually be the album I have played the most during my lifetime. It was the sixth studio album by the Beach Boys and can be considered Brian Wilson’s first full sophisticated production epic. It is a concept album and a grand ode to summer. “I Get Around,” “All Summer Long,” “Little Honda,” “Girls On The Beach,” “Drive In” and “Don’t Back Down” are a part of the idyllic and endless summer of my youth and at sixty that’s not a bad place to visit every once in awhile. 2) Beatles 65 by The Beatles. I respect such Beatles releases as Sgt. Peppers, Rubber Soul, and Revolver but lately I have actually been listening to this album. Maybe simple is better. I am still enthralled every time I hear George Harrison’s guitar sound that opens “I Feel Fine.” The rest is smooth rock ‘n’ roll at its best. “I’m A Loser,” “I’ll Follow The Sun,” “Everybody’s Trying To Be My Baby,” “Baby’s In Black,” and “Honey Don’t” may not be the most creative music The Beatles ever produced but it is among the most listenable. 3) Highway 61 Revisited by Bob Dylan. Dylan had gone electric and the resulting sound, textures, depth, and lyrics of this album have fascinated me for years. “Like A Rolling Stone” alone makes it a keeper. Rolling Stone Magazine would rank it as the greatest song of all time. When you add “Desolation Row,” “Queen Jane Approximately,” “Ballad Of A Thin Man,” “It Takes A Lot To Laugh, It Takes A Train To Cry,” and more it all adds up to years of thoughtful listening. 4) Scarecrow by John Cougar Mellencamp. Music from the American heartland. “R.O.C.K. In The USA” is catchy and was a huge hit but it is songs such as “Small Town,” “Rumbleseat,” and especially “Rain On The Scarecrow” which keep drawing me back. It is one of the few albums where I really think the artist is both passionate and sincere. 5) Greatest Hits by Pat Benatar. What can I say? I thought she was hot in my thirties, I thought she was hot in my forties, and well you get the idea. I also enjoy her brand of hard rock and while her studio albums may be a little uneven in places, when you gather her best material in one place it is excellent. “Hell Is For Children,” “Promises In The Dark,” “Love Is A Battlefield,” “Shadows Of The Night,” and a host of others all contain lyrics that walk on the dark side of life and that has an odd appeal as well. 6) Get It by Dave Edmunds. Just accessible pop at its very best. His version of “I Knew The Bride” makes the list of my favorite songs and “Get Out Of Denver” plus “Here Comes The Weekend” are not far behind. Why he has not been a bigger star in The United States is beyond me. 7) Party Doll And Other Favorites by Mary Chapin Carpenter. From the enthusiasm and joy of “Passionate Kisses” and “Down At The Twist and Shout “ to the thoughtfulness and challenge of “Stones In The Road” to just the good music of “Shut Up And Kiss Me” and “Quittin’ Time,” Mary Chapin Carpenter has put together a country/rock catalogue that is second to none. 9) Are You Experienced by Jimi Hendrix. I saw Hendrix live for the first time when I was in high school and how I convinced my parents to let me travel into New York City for the performance I have no idea. His debut album still knocks me out forty plus years later. “Purple Haze,” “Fire,” “Foxy Lady,” “The Wind Cries Mary,” and “Third Stone From The Sun” continue to amaze me on a regular basis. 10) Cricklewood Green by Ten Years After. I played this album to death when I was in college and continue to listen to it today. Ten Years After had terrible production on a number of their early albums but here they got it just right as “Sugar The Road,” “Love Like A Man,” and “Year 3000 Blues” are creative fusions of rock and blues. 11) Winter Carols by Blackmore’s Night. Ritchie Blackmore of Deep Purple and Rainbow fame met background singer Candice Night in the early nineties and by 1997 had formed a rock/renaissance group that has one of the most unique and joyful sounds I have heard. Their Christmas album receives a lot of play in my home during the holiday season. It is a combination of traditional carols and lesser known tracks. Their “Lord Of The Dance/Simple Gifts” medley is the holiday season at its best. 12) Gettysburg Soundtrack: Music by Randy Edelman. I am a Civil War buff which led me to the Gettysburg film which in turn led me to the soundtrack by Randy Edelman. The music is grand, poignant, and soaring and it lets my mind wander along with it. Not bad from an old folk/pop, singer/songwriter like Edelman. This album is a constant companion in my car and its amazing how many times I pop it into the CD player while on the road. Edelman has also been married to Jackie DeShannon for over thirty years but that is another story. That’s my dozen essential albums at sixty. They may change in the next year or so but that’s the beauty of music, there are always new surprises to be enjoyed no matter what the age but dang I’m getting old. You are currently browsing the archives for the Jackie DeShannon Reviews category.